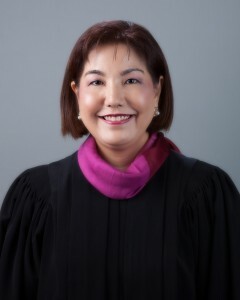 Karen Tooko Nakasone was appointed by Governor Neil Abercrombie and sworn in as a First Circuit Court Judge on November 1, 2011. Prior to her appointment, Judge Nakasone was a trial and appellate litigator for the State Office of the Public Defender for 15 years. She also served as a law clerk to the Honorable Simeon R. Acoba Jr. at the Intermediate Court of Appeals. Judge Nakasone was a 2008 Pacific Century Fellow, and in 2009 was named one of the Best Lawyers Under 40 by the National Asian Pacific American Bar Association. Judge Nakasone is a graduate of Hawai`i Baptist Academy, Bryn Mawr College, and Boston University School of Law. She also attended the University of Hawai`i at Manoa and studied abroad at the University of the Ryukyus in Okinawa, Japan, on an Okinawan Prefectural Government scholarship from the Hawai`i United Okinawa Association.